Sicily has a rich and unique human and natural history, with man-made and natural wonders scattered throughout the island. This begs the question, where’s the best place to stay on the island? Sarah weighs up the options in her travel tips for visiting Sicily. 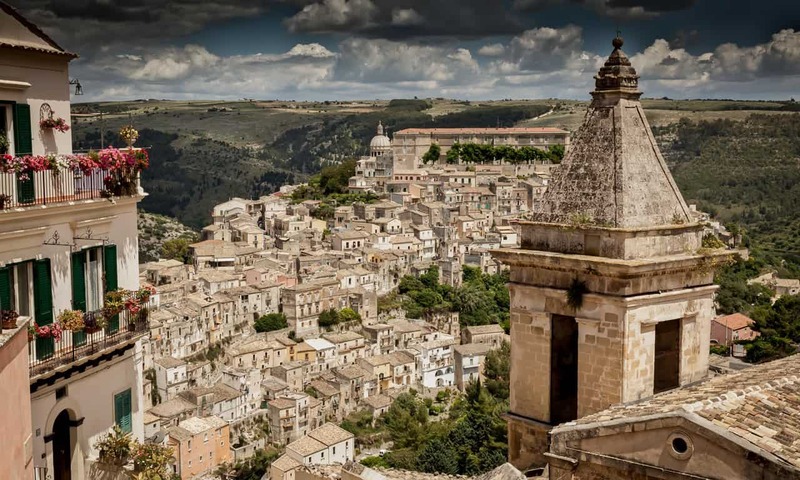 Ragusa is one of seven towns in Val di Noto recognised by UNESCO for its Baroque architecture. Sicily is the largest island in the Mediterranean with an area of 27,708 square kilometres or 10,698 square miles. People come to explore the island’s rich and complex history as well as its golden beaches and active volcanoes. The towns and cities we visit today have not only been shaped by, among others, Greeks, Carthaginians, Romans, Arabs, Normans and the Aragonese, but also by volcanic and seismic activity. Many mistakenly think that because Sicily is an island it is difficult to get to. Nothing could be further from the truth … whether by plane, boat or train. International flights from around Europe land at Palermo Falcone Borsellino, Catania Fontanarossa and (to lessor extent) Comiso Airports. There is also an airport in Trapani, but this only serves local Sicilian airports and other Italian destinations. Yes, you can even take a train to Sicily. The island is separated from the Italian mainland (at the tip of the toe) by 5 kms of sea known as the Straits of Messina. A ferry runs between the port of Villa San Giovani on the mainland and the Sicilian port of Messina. Carriages, which transport cars as well as foot passengers, are loaded onto boats and ferried across the sea. Regular direct services run between Rome and Palermo. For details about ferries to Sicily, check the Direct Ferries Website. There are also regular bus services between Sicily and mainland Italy – for timetables and prices see the Orariautobus Website. Sicily is a big island but the main centres are well connected. There is an excellent motorway network (four motorways), and a good public transport network. Buses tend to be more frequent than trains, and have a great reach throughout the island. The two main train lines run between Messina and Palermo and Messina and Syracuse. On these two lines the service is fast and frequent, but other routes tend to be more infrequent. The bus network is extensive, with main hubs at Catania and Palermo. For timetables and prices see the Orariautobus Website. Follow this link for a more detailed map of the archaeology and history sites of Sicily. Where you choose to base yourself depends on a number of factors, including which airport you’re flying into, whether or not you will have a car, what you want to see, how long you are staying, and even what time of year you will be visiting. You may not want to stay in the polluted cauldron that is summertime Palermo when you could be at a beach resort. Whereas in autumn, winter or spring Palermo is a very pleasant place to stay and not overrun with tourists. Read: Mosaics, Markets and Mummified Monks: Visiting Palermo, Sicily – my list of ten reasons to visit Palermo and five day-trips to take to get out of the capital city. Looking on to Mount Etna from the ancient Greek theatre in Taormina. On the east of the island, Taormina is an picturesque bougainvillea-draped town built on top of a hill above a rugged stretch of coastline. The town overlooks a large beach and a few other, smaller ones. The beaches are linked to the historic town centre by a cable car or a twisting road. The town has a stunning situation with glorious views. Hardly surprising then that this is Sicily’s top tourist spot; as it has been for a couple of centuries. In the 19th century Goethe’s praise for the town ensured it became a mandatory stop on many a Grand Tour itinerary. Taormina is best known for its beautiful 3rd century BC Greek theatre. Still used for various theatrical events the audience, as they would have done in ancient times, looks on to the stage and with a spectacular view of the sea and Mount Etna beyond. As a popular destination in Sicily, visitors are well catered for. There are not only a number of small family-run hotels but also a a few more expensive ones situated along the beaches. A few campsites meet the requirements of budget travellers. Although Taormina is very busy in summer, it is a favoured location throughout the year. On the GetYourGuide platform there are around 60 activities for visitors to Taormina to experience. 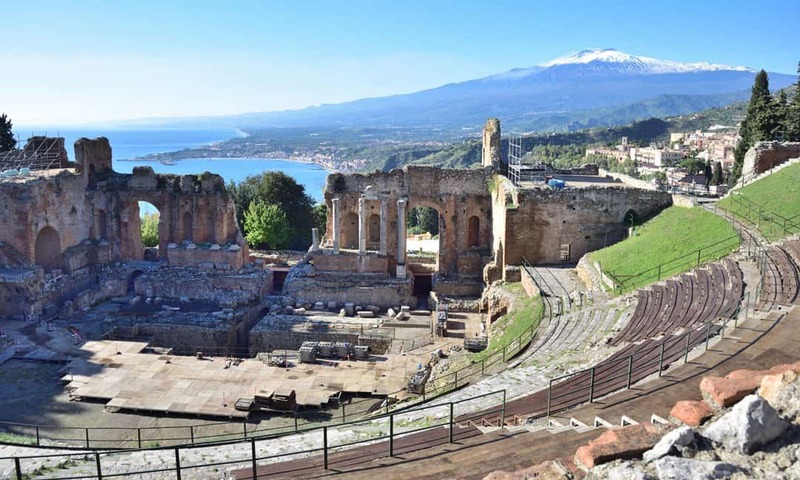 For example take a day-trip to the UNESCO listed town of Syracuse, or see the Greek and Roman ruins of Taormina on a walking tour. Take a break from history with a day tour to Mount Etna, or for those who enjoy cooking and food, you can either learn how to make pizzas or take a food and wine walking tour. See The Full List of Tours and Activities on offer in Taormina. Ruins of the Medieval castle on the hill above Cefalù. About midway along the northern coastline is the seaside town of Cefalù. It is an attractive small town with some impressive archaeological remains and also a pleasant sandy beach and harbour where you can see the day’s catch landed. Cefalù is famed for its magnificent twin-towered cathedral (Duomo) with golden mosaics, a sister to the one in Palermo, which dominates the old town (centro storico). In front of the cathedral is a cobbled square with pavement cafes, and parallel streets that lead down to the sea. This street plan is a vestige of the town’s Norman history. The square is so sloping, in fact, that by the end of each evening many of the chairs and tables have somehow migrated down the cobbles to the bottom. At closing time I saw the waiters having to move them back up the hill to their proper places. A walk down the steep back streets towards the harbour will bring you to an unusual relic of a bygone time, the communal clothes-washing area, the Lavatoio Medievale. Arab in architectural style, it’s well preserved, with a fast-flowing stream running through it; it was still in use within living memory. 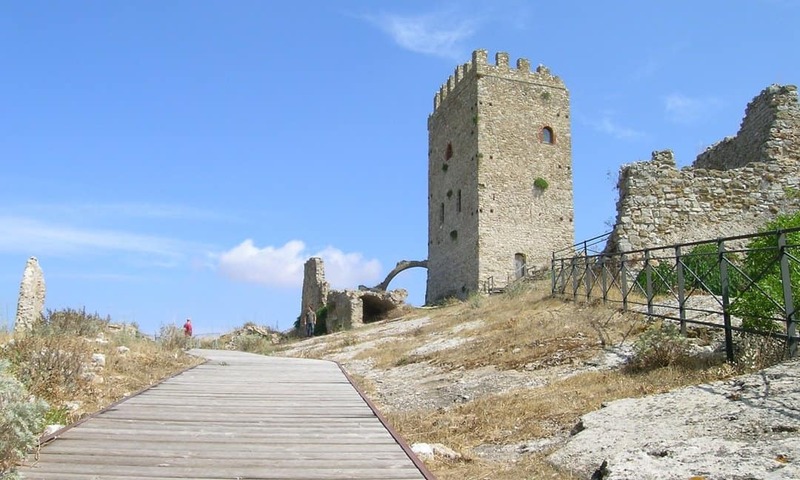 Just off the high street you’ll find a paved narrow street that leads steeply up the rocky crag towering above the town (the Rocca), on top of which is a megalithic stone ruin known as the Tempio di Diana (Temple of Diana) dating from 400-500 BC. Here you will also find the remains of a Saracen castle with its impressive doorway and paved battlements. So peaceful and atmospheric is this spot that it is one of my favourite memories of the island; I watched a hawk flying from the battlements below me out over the blue sea. I was very lucky to have the whole place almost to myself, with just one other intrepid tourist, a German lady, to share it with. A steep climb but well worth it. The train from Palermo takes about an hour but unless you are planning to spend a few days here I would suggest taking a tour to make the most of your time. On GetYourGuide, there are a few activities for visitors; including a Five Hour Godfather Tour and Sicilian Cooking Lesson. See the Full List of Activities and Tours in Cefalù.